I saw this movie over the summer and (dare I admit it?) burst out in tears during the final frames. 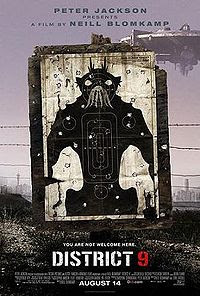 I felt really silly considering I was the only one crying, but I found District 9 to be extremely profound and moving. I agree, I was really invested in Christopher Johnson and his son. And Wickus. I came to love him during the final half of the film. He was so ignorant and easy to hate at the beginning, but I felt he really transformed (and not just literally). He was flawed, but I think his heart was good. I could cry now just thinking about the end of District 9. Wow. Btw, I have never seen Robocop. You know that scene towards the beginning when there is a Robocop demonstration and this guy gets killed in a board meeting? That scene horrified me so badly, I have not been able to bring myself to try to watch it. Again John, this was wonderful to read! Thank you for your comment -- I'm so glad you enjoyed the review. And you know what? I'm right there with you in terms of how it affected me. I found myself choked up, unable to speak, actually, after District 9 ended. I was really moved by this film. I had a frog in my throat, and I know Kathryn thought I was crazy. Go back at watch RoboCop if you can, but pass over the ED-209 massacre, and you'll find a lot of the same elements as in District 9: a social commentary and lots of egregious, almost video-game-style violence! I've got to see this! It was one of the few summer pictures I missed, and now I really regret that. And, holy lit class! I didn't know The Metamorphosis I studied in the course would have such an application in a sci-fi thriller as this. You've convinced me, JKM. And your examples of current corporate influence in media, and lies they sell to us, is chilling in its own right. Thought-provoking review and examination, JKM. Thanks for this. p.s., @Amanda, given of what I heard about the graphic images in District 9, if you can watch that, you certainly can watch (and enjoy) Robocop. I dare say that both Verhoeven films, Robocop and Starship Troopers, offer some of the sharpest (and popularly violent) cinema criticism/commentary of corporate greed, dogma, and fascism from the last century. They are worthy viewing. Through all of its bleakness, District 9 ended with a profound message of hope. The hope that it offers is commensurate with the bleakness that preceded it: If it were less bleak, it could not have been as hopeful. It seems that the film had a profound impact on all of us. Loved reading your thoughts on this, which is probably the best SF movie of the decade. I want to second leOpard13's addition of Starship Troopers to your list of POTA and Robocop as terrific misanthropic satire masquerading (quite effectively) as action-packed entertainment. I will say, for myself, that of the four District 9 is, oddly, the most hopeful... Apes ends bleakly and devastatingly ("You blew it up!") and Troopers ironically (fascism wins, and the audience cheers); Robocop has a positive ending - Robocop rediscovers his humanity - but Wikus never really becomes truly human in the best sense until he no longer is (hmm, they've paved paradise and put up a parking lot). (The character of Wikus' lieutenant, who places himself in danger to blow the whistle on MNU, indicates that Blomkamp doesn't believe humanity is lost, but that we've lost our humanity... Kafka-esque situations are always described as dehumanizing, after all). Regarding the actiuon finale: I agree, its a spurious complaint. Note that the best action beat (Wikus-in-robo-suit grabs rocket from air) is shown ad infinitum in trailers preceding the film's release... yet when the scene screens there is no loss of excitement at that thrilling special effect... even more, the action becomes stand-up-and-cheer, even moving, because of the context that has been established and because of Wikus' long, slow transformation from human insect to insect-shaped human. I definitely second (or third...) the recommendation of Starship Troopers here: as vicious, blazing and brutal (and funny) a satire of the American way as has ever been crafted in a "mainstream" action movie. I also agree, Pete, that there is hope in District 9 -- a critical element, as you noted. You guys (and gal!) are the best. Glad to see I'm not alone by a mile in my admiration for District 9. I agree with you DLR: surely it mus be in contention for best sci-fi film of the last decade. Totally with the Kafka comparisons. Just a note that the noble alien thing doesn't quite fit with the scavenging brutalised prawns that tear pople to bits, just as humanity varies between the self-sacrificing assistant who goes to prison for revealing MNU's illegal bio research or Wikus himself, finding his own obility, and the brutalised materialism or plain sick violence of others: I think rather they reflect humanity in all its dizzying variety. What a piece of work is man, indeed! I just watched this film for the first time last night. It was my wife's second time and at the end, she broke into an uncontrolled torrent of sobs that lasted several minutes. I wasn't as affected, but I saw why she was. This is a very depressing movie, one that basically upholds the worst in humans. My only quibble is that MNU, upon learning that Wikus has been infected, acts against their own best interests. Here they have a subject more sympathetic to their needs than the Prawns, more understanding of their viewpoint. They've showed their ability to lie with honey in order to get what they want -- it would've been nothing to do so with Wikus. Instead, MNU acts out of nothing but sheer brute, idiot force and ends up bringing on their own ruin/prolonged inconvenience. Such a tactic serves the movement of the plot but doesn't ring particularly true. Otherwise, this film was absolute brilliance and I can't wait to watch it again, despite the fact that it tears at my heart a little. There's so much to explore still. Great comment. I am there with your wife: this film is deeply affecting to me as a statement of the human (and alien...) condition. This is a great review, but isn't the whole individual versus institution thing more Orwell than Kafka (though that would lose the nice bug connection)? In Kafka, everybody seems at a loss. The straight world, Gregor's family, and Gregor himself all seem a bit gobsmacked by the transformation. It isn't that tey don't want to help, but rather that their world can't fit him. It isn't sinister, but impotent. (That's why I've always felt that The Meta is a allegory for a family crushe by the mental illness of one of its members.) Ultimately, Gregor's death, which frees them from the system bucking weirdness of his transformation, liberates his family. They are so genuinely happy to see him go and his death is the only "noble" thing he's ever done. In the The Trial, for another example, K. is dragged before a judge who is equally confused that K. isn't the house painter that the judge thought was supposed to be on trial. In fact, the judge seems willing to let him off until K. declares heroically that he won't appear at his other hearings, a statement that makes the judge assume there are more hearings and convinces him to send the paperwork on. K. gets killed because of a dumb misunderstanding and a clerical error. It doesn't seem, from your analysis, that the characters in D9 live in the same world of darkly comedic errors and blind fate. It requires heroes and villains, something Kafka found comically absurd. Am I misreading your take? Am I misreading Kafka? All that said, I haven't read a review this engaged and passionate in, hell, decades. Great writing. CRwM: Thank you so much for a thoughtful comment (and for the compliment on the writing!) I appreciate your words so much! I don't think you are misreading Kafka at all, and the Orwell comparison is probably good too. I wonder if I should have used Orwell as the start point (but the man to bug transformation was so startling...). As far as D9 and Kafka, I felt -- and I could be very wrong -- that the film's characters do live in a darkly comic world (kind of like Robocop). Wikus -- trying to show off in front of his subordinates -- ends up spraying the black fluid in his face, and changing his entire existence. It's sort of horrific slapstick when it happens. And, there is one way of reading the film in which there are no real (human) heroes, per se. Wikus shows backbone (and stands up for Christopher Johnson and son), only when he's been "infected" or suffused with Prawn DNA. In other words, when he's less human or even no longer human. I don't mean to take anything away from him (especially given the haunting ending), but I wonder if Wikus becomes more noble and understanding once he is in the skin of a prawn. Again, that strikes me as very Kafkaesque: finding your heart when you're a bug. I finally watched this, and I agree that it was one of the best films of '09. Additionally, I wholeheartedly agree that it is on the same level as the genre landmarks film you mention, JKM. I spoke with a co-worker recently who saw this last summer with a friend from South Africa. She said that her friend pointed out the many inferences (obvious and subtle) concerning Apartheid in the film. As well, the one person (interviewed throughout the film) who lists the possibilities of what could happen upon the return of Christopher Johnson harkens back to the worry among Afrikaners after Apartheid ended (something Eastwood's film Invictus covered well). That realization really brought home the "wake up call" of Blomkamp's film, as you mentioned. Besides that haunting final image of Wikus, for me, was Christopher Johnson's stunned inaction while he gaped at the results of human experimentation on his brethren. It was a poignant and feeling counter to the first person shooter perspective offered here. This film is pretty unforgettable. Thanks, again, John. Forgive me in advance if I repeat any thoughts from the previous comments. I will be reading those soon. Your piece is inpspiring JKM, as is most of your writing as I'm discovering. I will need to reach back to the classics for this book, The Metamorphosis. I must tell you this is precisely how the film worked its way into my own heart. What a powerful, visionary work and your parallel to the aformentioned book can't pssibly be by accident for Blomkamp. It's been evident for some time that Director David Cronenberg has been inspired by the work of Kafka. The Fly literally features the kinds of transformations you mention. And to some degree, and I have not seen it, I believe Cronenberg's Naked Lunch also points to the influence of Kafka. 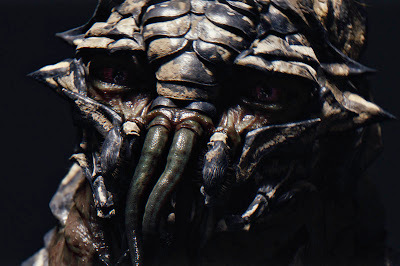 Until District 9 came along, The Fly may have been the best at making such a powerful statement. District 9 takes it to a new level incorporating the politics and other social elements you mention here. I haven't read the book, but District 9 has to be a modern interpretation of such a classic. I, too, feel the climax is powerful as a result of our "emotional investment" as you mentioned. I feel a percentage of people really missed the boat with this one, but many more saw the picture as you describe it. The handling of Christopher is so heartwrenching based on everything we know about his love of son and home. When he looks downward at gunpoint - lost, he's more human than we are. That is a killer moment among many. The ending is one of the finest on film I've seen in a long time, poetic like Blade Runner was poetic with Rutget Hauer and the dove in the rain. It's just a powerful moment. Went back to read all of the wonderful comments and concur with all. There is so much to explore with this film and the emotional payoff is extraordinary. I haven't felt moved by a movie like this one in a long time. Great comment my friend, and thank you for the kind words. You are no slouch in the review department yourself -- I have enjoyed reading your insights on your blog as well. And yes, this is an enormously moving film. You don't realize it at first, and than it hits you like a brick.